SUMMARY: In the year 2019, three teenagers embark on the journey of a lifetime: a week-long stay on the space station DARLAH 2, inside the moon's Sea of Tranquility. Selected by international lottery in NASA's publicity-grabbing campaign for funding, the teens have relatively little training or even interest in science or the space program. As the moon mission quickly turns from bad to worse, the teens and astronaut crew begin to fear that they are not alone. STATUS IN MY LIBRARY: It's not out yet, so we don't have it. I am debating on this one because of the intensity of the violence. It's fantastic, and I know my horror-loving students will love it, but even I (a big fan of thrillers) had trouble sleeping after reading it. It may be one for my "high school shelf;" I need to chew on this one. 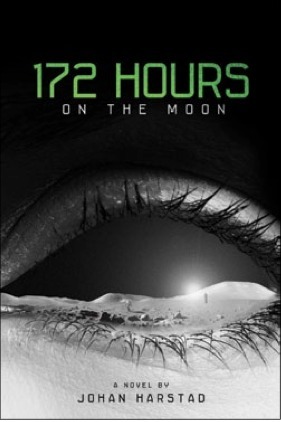 WHAT I LIKED: 172 Hours on the Moon is one of the creepiest, most chilling books I've ever read. After the first 100 pages, I finished the rest of it in one sitting. Gripping and suspenseful, 172 Hours is one of those books where you constantly ask yourself, "How can they possibly get out of this?" I must give props to the translator, Tara Chace. If the front cover did not tell me 172 Hours was a translation (from Norwegian), I would never have known. With smooth flow and a story that grabs you and won't let go, I frequently forgot that I was reading rather than experiencing. Illustrations, advertisements, maps, and photographs sprinkled throughout add to the story and help readers visualize places only a very small number of humans have ever visited. Despite numerous illustrations, Harstad describes the horrific evil inhabiting the moon without any visuals, which would probably have taken away from the horror of it anyway. Imagining what lurks out there is far more scary than any photograph or drawing could ever be. I have seen a few reviews that complained about the ending, but I really liked it. It was such a cool twist that I went back and reread a couple of parts to see how they worked with that ending. Be ready to sleep with the lights on! WHAT I DIDN'T LIKE: Initially, the three teens are really not all that likeable. They seem bratty and spoiled, and they all believe their lives are terrible and could be better elsewhere. Antoine is nothing short of an obsessed stalker, and Mia's rude treatment of her parents, while believable, does not make her likeable. They did eventually grow on me though, and their moments of remarkable courage in a dire situation helped to redeem them. THE BOTTOM LINE: Original, eerie, and intense, 172 Hours on the Moon is page-turning sci-fi action that will stay with readers long after the shocking and heartbreaking conclusion. Not for readers who don't like scary thrillers with a healthy dose of violence. Adding it to my pile. Great review!